Taj: I would like very much to spend my remaining days here as your assistant. 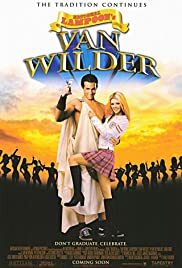 Van Wilder: Okay, we're just going do a little word association. Say the first thing that comes to your mind. Milk. This is yet another movie trying to capitalize off the gross-out factor among young adolescent males. The only thing that really surprised me about this movie is Ryan Renolds ability to carry a movie by himself, as Tara Reid has proven herself once again to be a terrible actress. There is maybe one or two really funny parts in this movie, the rest just comes off as immature sexual jokes. Overall, the good parts don't outweigh the bad, and I wouldn't give it more than three or four stars. Wait for it to come out on rental, which shouldn't be too long.